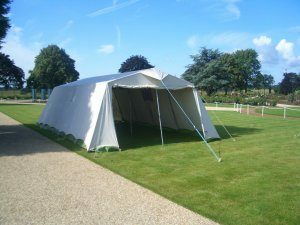 For your outside function we can supply a variety of tentage, erected and taken down for you. A modern framed one with no guy lines so can be erected in little more than the floor size of 6 metres square (19′ 8″). We’d like 3 feet extra all round for access and to fit securing straps if required. 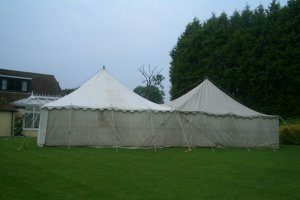 And two traditional marquees with a floor size of 20 foot square each. 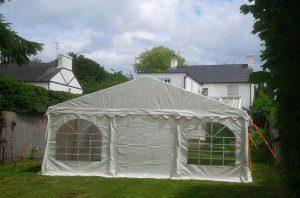 As in second traditional marque picture we can put them both together giving a covered space of 20×40 foot. 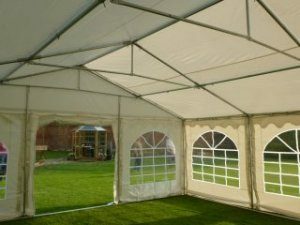 In addition, we can supply some smaller, so called “mess tents”. Of these we have a total of two 20 foot by 10 and one, 30 foot by ten. 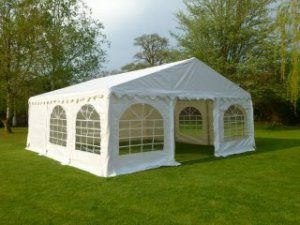 We also have a similar looking tent that is 30 feet long and 10 feet wide and can have its windows and doors where you want; could it suit your garden party? 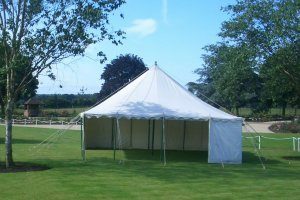 We also have expertise in putting up similar large tentage and would be happy to quote for supply and erection of our tents and erection of others. For these services, please contact our tent hire specialist Steve Lindsay, 07775 544344 or email ordosteve@btinternet.com, or use the form below.